We offer many types of welding fluxes for forge welding. Our greatest source comes from Superior Flux under the brand name Anti-Borax. 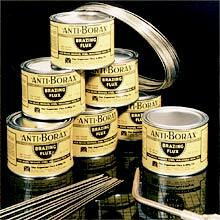 The Anti-Borax Company was founded in 1902. More than a century has passed and the fluxes are still used for bronze brazing, cast iron welding, and other applications used for metal joining in blacksmithing and forge farrier processes. Our Brazing Flux is used for brazing brass, copper, steel, malleable iron etc. We offer the most efficient and economical bronze brazing flux on the market. Cherry Red is a rapid compound for surface hardening and blacksmiths cannot go without this wonderful compound It is a must have in your professional shop! Our Tinning Compound can be used for tinning bearings, radiator connections and auto bodies.